Warid brings astonishing international calling feature for its valued subscribers. Now customers can make international calls with an efficient service of this telecommunication. In previous era it was really difficult to get an offer to call in international countries but this network has introduced an exceptional Warid 48 Paisa offer for its consumers to makes non-stop calls in other countries. It provides countless countries calling facility for subscribers and they can easily make unlimited phone calls by using it. It provides facility to call at 31 countries around the world and that is really exciting information for customers. There are other telecommunication companies are not providing this kind of international voice calling service to call more than 30 countries for consumers. Warid is only one telecommunication of Pakistan who is serving this type of facility of its valued postpaid and prepaid subscribers. Mostly cellular operators think the charges of international features are expensive and it is really difficult to afford international calling package to call on regular basis but from this network clears your wrong perception by launching this 48 paisa offer of Warid. The incentives are really attractive in this feature and subscribers who want to call in international countries around the globe are attracting to subscribe this offer to use on daily routine. This telecommunication always introduces features with an excellent service and at this time it is also providing same facility of customers. Subscribers don’t get any kind of network issue by using it and they can easily communicate with his/her overseas family member without facing any kind of network problem. This is extremely brilliant international calling feature has created from this network side and now subscribers can get close with his/her overseas family member through cellular phones. This telecommunication always introduces packages with reasonable charges and this telecommunication reserves a trademark to gives amazing incentives of its valued consumers with affordable rates. All criteria and various class cellular operators can easily afford this facility to use on regular basis and if you have a family member who lives far across from the border so just need to activate an offer to communicate with them, share your feelings and love with them at anytime in a day. There are lots of people who have two or three family members are living other countries of the world so this is a preferable package for all of them because it provides 31 countries voice bundle feature to call in cheap charges so they can use to make calls in different countries of the world. Customers can easily activate this feature just need to write SMS “ON” and send to 4343. The daily rental charges for prepaid customers are RS 2 per day. In case of rental failure, feature will no longer be valid and will have to be re-subscribed. The monthly rental charges for postpaid customers are RS 60 per month. 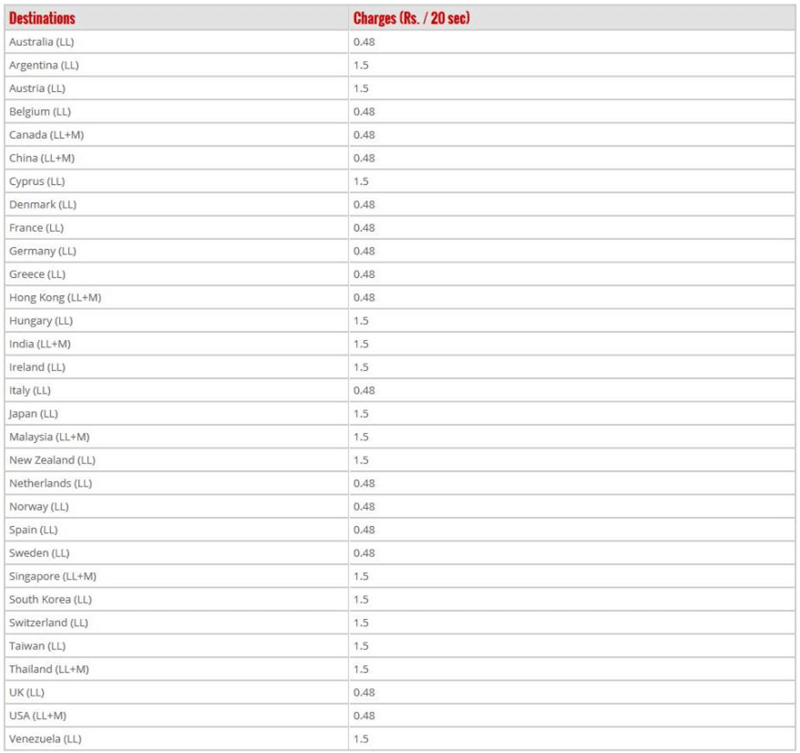 The mentioned below charges are available for land-line and mobile numbers for 31 countries. Subscribers can DE-activate this offer just need to write SMS “OFF” and send to 4343. There are no charges for UN-subscription. This offer is available for prepaid and postpaid customers of Warid. Customers can also use other Warid international packages with this feature. This is limited time period feature. This offer is available to call for 31 countries of the World. This telecommunication reserves rights to change calling or rental charges at anytime without any notification.